CAMPS, SCHOOLS OR JUST FOR FUN AT HOME. I have been asked to add to my site more Jewish resources not just camp crafts. Many of the sites and lessons on my General Craftsand Polymer Clay crafts have been used for Jewish Crafts. I have added many crafts to this list that can be used easily for: Sunday Schools, Day Schools, scouts and others. Eileen's Purim Crafts and Resources. Eileen's Passover Crafts and Resources. crafts, beadie projects, recipes, links and fun! Includes many links to Purim and Passover on the Net besides my own ideas and projects. My new original designs now include PURIM and PASSOVER projects! The hottest kids crafts crazy in years are Pony Bead Projects for : Beadie Animals/Critters/Buddies etc. I have had many requests for Jewish Patterns. (Lots of crosses out there but nothing Jewish.) So my boys and I have made some Jewish Symbols to get you started thinking and designing your own. (Let me know if you design any and I will add them to my site.) See my beadie animal page for 100's of general patterns and instructions. Our newly updated pictures of our Judaic Camp Crafts. Beaded King and Queen Crown that can be used for Purim. Polymer Clay Havdallah Spice Jars. Jewish Clay Stamp Projects and Ideas. Havdallah Candles - Rolled Beeswax Sheets. Clay Mezzuzah Charms and Hebrew Name Necklaces. Clay Dreidels and Dreidel Charms. Clay on Glass - Shabbat Candles and Havdallah Jars. Clay on Paper Mache- Havdallah Spice Box. Has Scouting or Guide Information for Jewish Troops. Chanukah Crafts and Starting Your Own Family Tradition. This is a list of more of my own Chanukah craft ideas as featured in article on Shalom Boston's Web site. New Year Holiday Crafts and Inspirations. Check out their great Holiday tips, articles, recipes, community guide, calendar and more! They have some great menus and recipes for Passover too. If you are visiting Boston and New England or live there. Check them out. Fellow crafters, in this case of Jewish Crafts, that have unique craft projects they are willing to share but do not have a web page to post them on. I am posting their crafts on my site for you to be inspired or to use their great lessons/crafts. Have a craft or Jewish craft to share? The following sites are mainly for holiday crafts. Remember to hit reload ever time you come to this site, as I update frequently and most computer networks save old copies to "help" you. 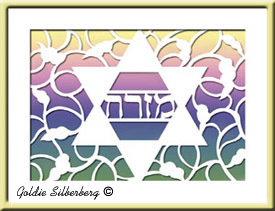 Incredible fine artist and Judaic artist, Goldie Silberberg has kits for paper cutting and free lessons to share. She also has beautiful Judaica for purchase on her other site. Ketubahs, family trees, Bar and Bat Miztvah gifts and more. JTS's Melon Centers - Kids Corner Holiday Coloring Books. Coloring pages and poster for all of the holidays. Also has lessons. With links to more things to do. 1000's of Links to Israel, fun, crafts, games and information on Jewish Holidays, Hebrew lessons and more. Including Chanukah, Passover, Rosh Hashana, Yom Kippur, Sukkot and Purim. Plus MORE! About.com Judiasm sites A huge resource. It has crafts for holidays etc. You can also use their search engine to find more. JudaicaJournal by Dr. Mom. Wife, Mother, Doctor, Artist. Has a blog with incredible pictures of Judica including needlecrafts. Great inspiration. Great for preschools, camps, sports programs, and elementary schools. Search on Jewish, Shalom, Hanukkah. They have 10 plus kits. Need beads? Scout craft supplies? Basic kids craft supplies? Bulk packs for scouts, Sunday school teachers, homeschoolers and more! Check this store out. Making Friends Jewish Craft Pages. Including featuring two of my Jewish bead patterns with great diagrams and instructions. One for my dreidel pony beadie and the other for a Star of David beadie. This great and every changing site for crafts and pony bead projects has some crafts that can be adapted for a Jewish setting. In addition to the new style paper dolls discussed on my General Crafts page, the Jewish craft section of Making Friends includes clothes from the bible to use on their paper dolls. The children can color and decorate the clothes. Suitable for Temples too! Looks great for Sunday schools especially for props for Tot Shabbats. Another interesting craft on this site that can be used in a Jewish setting is a Making Friends.Com - Beaded Tiara.Could be used for Purim Queen Esther crown. Uses pipe cleaners and pony beads. Cute! Homeschoolzone's Pitter Patter Craft Library.WoW! Some really great and unusual crafts! It has been around for awhile, don't know how I could miss this! 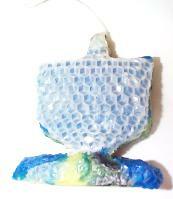 I am listing it main craft (100s and 100s) on my Basic Craft pages. It does have * Holidays. Including a few Chanukah and Passover Crafts, Recipes and Book Suggestions. Torah Tots.Com. Great religious education site for young children. It includes: games, stories, educational links, music and more. It also sells baseball style cards about the Torah called "Torah Cards" to collect. It has *Fun and Games as well as Coloring pages suitable to use in : Preschools , Day schools and Sunday Schools as print outs, craft projects or to just for fun to color on the computer. It includes coloring pages for *Chanukkah, *Sukkot, *Rosh Hashanna, *Yom Kippur, *Tu B'shevat, *Purim, *Passover, *Shavout,and the *Morning Prayers. JOANN Fabric and Crafts stores in addition to the pony bead patterns listed above has many general craft projects for adults and children. They include a few with Judaic themes including: decorating for Elegant Beaded Menorah and for a Making a Children's Menorah. IdeaNet. THE Internet resource for Jewish youth professionals. Great resource with opportunities to post questions on their teacher help pages. With back issues of this List to browse. Has lots of categories with a search engine for ALL Jewish professionals with links to schools, Shuls, youth groups etc. Check it out. Free Kids Crafts - Jewish crafts Has a page of links. Plus Chanukah and Purim Crafts and more! She has started a page of Bible Crafts that include links to some shared crafts and Jewish Bible Crafts. Now has a Passover Page. Design Originals Publishes Craft books on many subjects including many on beadie animals. Has a great suggestion for a Tzedakah (charity)project. You make a beadie animal, they suggest a gecko (lucky? )and give it away or send it to them and they will give it to a charity.Called the Gecko Club A nice suggestion to get Sunday School teachers thinking? Holidays on the Net An award winning site. Has Holiday information, stories, games, crafts, greeting cards, links, teachers guides and MORE! Holidays include all Purim, Passover, Shavuot, High Holidays, Chanukah and more. Shrinky Dinks.com Has a site with directions for the plastic shrink art sheets. This is a fun craft and easily adapted to a Jewish Theme. What ever you can draw or trace can be made into a key chain, magnet, jewelry etc. The site offers seasonal and other free patterns of the month, plus directions for making a project. I have done this craft with even 3 year olds using colored pencils. (on roughed up sheets - see their prebuffed ones.) We at camp used 1/4 sheets, punched with paper punch and made great key chains. No limit to the imagination on this craft. See my parent page for more info and links to ordering information. Kid's Domain.ComHas PC and Mac Shareware and Freeware Programs for Kids recommended by families and teachers. Demos, reviews, programming for kids, and graphics. Holiday pages with mazes, puzzles, software, and crafts. Chanukah Crafts Including: *new wooden Driedle and *felt dreidel pin and more! 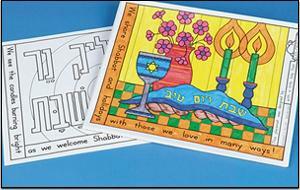 Just added Passover crafts. Rings&Things Project Page Wire and bead star. 6 sided! Paper Relief 5 and 6 point stars. This site has lists of Jewish Needlework,Crafts and Supplies. Including: patterns, instructions, photos and ideas. I have had this site on my needlework page for a long time. Jewish Nature Project. This site has a Jewish Nature Project Craft Page. It's Past Projects are really intersting. Some of my favorites are the Black Walnut Stained Challah Covers and sand candles. Actually I like the sound of all of them! This a great nature site for scouts, parents, teachers and more. Great Teva (nature) Tips. Fun with Jewish and Hebrew lessons. Learn about Heroes, holidays, Israel, Parshas and Hebrew. Includes great coloring pages including Alphabet posters. Stories, crafts,recipes, songs, lessons and more on Chunukah. Its great. It now has Hanukat Celebrates Passover Crafts, games, stories and more! Amazingmoms.com Another Huge site has Hanukkah crafts.. It has many other crafts, parent ideas, recipes and more. Childfun.com Has some Jewish information. Including Passover and Childfun.com's Hanukah pages. Some crafts and many coloring pages. This site is huge it has many holidays, crafts, recipes and more. Great for homeschoolers. Aish.com holiday PagesSome how this great site was lost in my bookmarks! Great Educational site for adults also has holiday information and fun activities for children. Including Purim Coloring Pages and more! Diagrams including many Hebrew Alphabets counted out and some patterns for popular words in Hebrew. Buy books at Amazon.com and help support this free site! These are just a few for the Jewish Crafts books my family have enjoyed at our house. Hundreds of Links to sites for reading Jewish stories, comic books, GAMES ( for little and big kids), music, make email cards, Holiday fun, learn Hebrew and Yiddish words and MORE! Crafts, Recipes and Links Page.